[I]n an ideal world an audio amplifier would not impart any sonic traits upon the audio signal it is amplifying. It should just amplify that signal. But as we know this is not an ideal world. 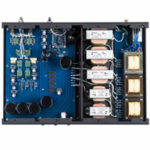 And every amplifier has a ‘sound.’ Thus, this review of the Seymour AV Ice Block 5001 mono-block amplifiers will attempt to convey the basic sonic traits of the 5001 amplifiers. If, after reading this review you have questions, suggestions, or thoughts, please use the comment section below. I was not on the hunt for another Class-D amplifiers to review. It has actually been several years since I’ve had a dedicated high end Class-D amplifier in my system. 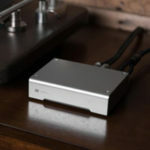 I think some Class-D amplifier can sound very good, but I am generally more interested in tube amplifiers, and more recently Class-A amplifiers. But I also have an open door policy to any piece of equipment that might be a good fit in the system. And why shouldn’t I? I’m not god. I’ve not heard all there is to hear. I don’t know all there is to know. So why pass up the opportunity to spend time with a new component? Therefore, here I am, a few months later, having spent hours with these sleek aluminum mono-blocks, and — dare I say — , enriched by the listening experience, and ready to convey that to you. The 5001 500W mono-block amplifiers sit in the middle of the Seymour AV amplifier line. Below the 5001 in power are the 2001 mono-block amplifiers, which offer 250W (US$999) of Class-D power, and the step up from the 5001 are the 10001 mono-block amplifiers, which offer a blistering 1000W (US$1,399) of cool running, Class-D power. Both the 2001 and 10001 are available in the same brush stainless steel or black pearl blue finish. All use the same vibration damped chassis design, utilizing Vibrapod isolator feet. Turned on, the amplifiers produce a soft blue LED glow that runs along the sides. These are without a doubt, slick looking amps. The rear panel offers a three pronged power jack, XLR or WBT Nextgen Topline RCA inputs, 5-way binding post, and D.H. Labs Revelation 99.99% pure silver signal wire. This was the preferred wiring, claimed to offer improved transients while retaining a relax presentation. The amplifier seems to come with an above-standard power cable, the AR Pro II Ferrite Noise Trap (FNT) IEC power cable. 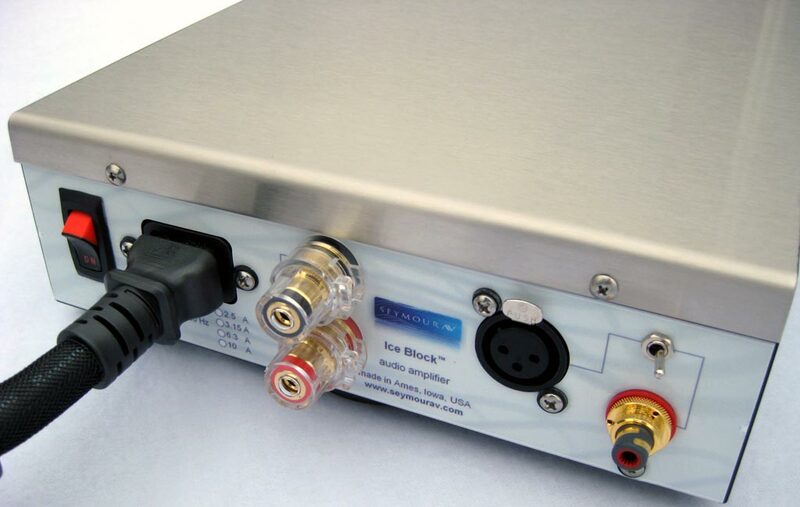 The FNT technology provides isolation from RFI and EMI interference. 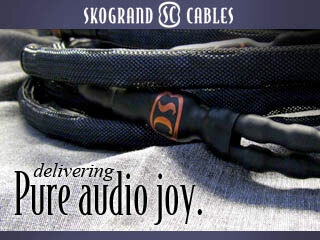 For the purpose of this review, the Granite Audio #560 power cables were used. I used the #560 during my review of the Jeff Rowland Design Group 102S Class-D amplifier, in which I stated that the #560 offered less noise, added punchier dynamics and better articulation than the default standard power cable supplied with the 102S. The Seymour utilized a circuit topology named ICEpower Class-D, a Bang & Olufsen technology. Since B&O integrated Dr. Karsten Nielsen’s ICEpower design into their BeoLab 1 in 1997, other audio companies, DIY enthusiast, cellphone manufacturers and others, have seen the benefits offered by the cool running, very power powerful, inexpensive, Class-D amplifier. Class-D can operate at close to 90% efficiency, which means very low heat and no wasted energy. It can be put in a very small box, which means it has many physical applications. Obviously every amplifier has its own sound, but Class-D amplifiers are generally thought of as being smooth and analog-ish sounding. This is the opposite of what one would expect for a digital amplifier but Class-D doesn’t actually mean digital amplifier. It is just the method of amplification design. Class-D amplifiers typically get criticized for their lackluster dynamics, their obfuscation of detail, and lack of linearity. Some amplifier designers have done a good job improving upon the ICEpower Class-D while some haven’t. But this doesn’t really mean much, since it could apply to anything. So, how did Seymour AV do? 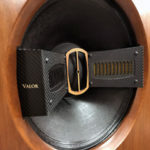 The pair of the 5001 monoblocks came with 100 hours of burn in, and it also went through additional hours of use before the review; thus it was completely broken in. I ran these mono-blocks in two slightly different systems. One system used a discontinued Marantz SA-7 as a source, Eficion F-250 speakers, WyWires and High Fidelity CT-1 interconnects, WyWires speaker cables, VooDoo Cables Platinum Dragon power cable, PS Audio Quintet, and a discontinued Superphon Revelation III pre-amp. This is my top system, as I wanted to see how the amplifier performed with $10,000 speakers, a high-end digital source, and cables that cost as much as the amps. The second system used Bogdan Audio Art Deco speakers, Audio Note DAC One Sig, Hagman USB to S/PDIF, and a Mac notebook; the cables were the same as in the first system. 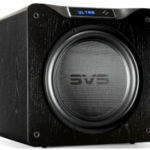 This, while still pricey, does drop the overall price of the system considerably and brings it more in line with the cost of the 5001 Ice Block amplifiers. Right off the play button the 5001 Ice Block mono-blocks sounded lush and with extended low end, but not overly ripe and bloomy in the lower mid-range. Their sound was pleasant and engaging. But at this point I was just trying to get used to their sound before critically listening and comparing to other amplifiers I had on hand. Generally speaking, the 5001 mono-blocks had no issues driving either speaker set in the two systems. I did not push them at too excessive a level so as they would clip, and they were plenty loud at two clicks past the half way mark on the pre-amplifier, about 60% of full volume. They showed no obvious issues, the sound was robust and nothing was obviously out of whack.